In the last month or so I've decided to step up my juicing. I want to get as many vitamins and minerals to my developing baby as possible and fresh, raw juice is one of the best avenues. Plus raw juice has beneficial enzymes that help assimilate all those nutrients without adding more stress on my body or the baby's. Increasing the amount of fresh raw juice I drink has been a life-saver in another area as well. It has given me so much energy throughout the day. When I'm tired a glass of raw juice can get me re-energized in no time to complete whatever crazy stuff is going on and my schedule does seem to be a little nuts right now. I would recommend lots of raw juice to anyone, but especially if you are experiencing a time of stress or fatigue. Below are some of my new favorite combinations. For more reading on the topic, check out a couple of Shannan's previous posts here and here. Remember that variety is truly the spice of life especially in nutrition and juicing. Using a wide variety of vegetables and fruits will expose you to the widest range of minerals and vitamins. Process strawberries, apple and pears through juicer and serve. Enjoy! Please feel free to share some of your favorite juicing recipes in the comments section. You're right, juices are great for energy and vitality! I'm sure your baby is loving it! I'm new at this. What do you do with the lettuce? The apple, celery & carrot is WONDERFUL!! I added half a lime and a knuckle of ginger to this combination for a little more zing. My favorite raw juice recipe is 2 green apples, 1 bunch of kale, 1 lemon, 4 carrots, and 1 good size knob of ginger. So yummy! Just started following y'all! Loving the blog! Hi Karla~ I found you through a Pinterest board for BlendTech and I was wondering if these recipes need to go through a traditional juicer or if you've ever tried a BlendTech? I've never used these recipes with a Blendtech, but I can't imagine why they wouldn't work with most juicers! What do you do with the lettuce? It doesn't say it's processed with the other stuff. Veggiev - you send the lettuce through the juicer just like the other veggies and fruits. This is my daily default raw juice. Sometime I use blueberries,cauliflower brocilli,strawberries,pinapple and other substitutes, but this is the tried and true. Everything is organic. The # 1priority is vitamins, enzymes and nutritional value, not taste. Although I do like the taste but not everyone will. Way to go Dee! Keep up the great work! Do you juice the greens first? and then add the veggies/fruits. I have a Jack Lalane juicer and they recommend sending the greens in first for some reason. Just wondering if with other juicers if this is necessary. I usually juice the greens last, but I can see the benefit of juicing them first...probably some of the other veggies and fruit push more of the greens through. I'm sure you get great benefits either way though so do whatever works best for you! Do I need to use only organically grown fruits and veggies? Penni - that is totally up to you. Many prefer only organic as the pesticides and other toxins will be transferred in the juice. If your budget doesn't allow all organic though, there is still benefits to juicing and it shouldn't prohibit you from trying it! What is the avg yield of each recipe? Anonymous - it depends on the fruit but closer to 24 ounces usually. Kale is just one of the more nutrient dense leaf lettuces to choose. A variety of dark green or red leafy lettuces (including kale) is good when juicing or in smoothies. Being a busy mom as well - I find most of my info in blogs and recipe sites. 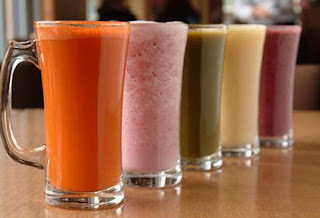 My favorite lately for raw juice recipes is the site for the movie Fat, Sick, and Nearly Dead. They have a really nice variety juice recipes. I also like recipes from the Forks over Knives site as well!